Sam Carr, the son of ledgendary bluesman Robert Nighthawk, was born on April 17, 1926, in Friars Point, Mississippi. Becoming proficient on the bass and guitar, Sam moved to the drums and soon after hired Frank Frost. The two then started touring with Sonny Boy Williamson II, and after his death, Sam hired Big Jack Johnson to form the powerhouse delta trio sometimes called Sam Carr's Blues Gang or the Nighthawks, while eventually being called the Jelly Roll Kings. Sam anchored the drums on Frank's 1962 and 1966 albums, as well as later Jelly Roll King recordings. As Big Jack Johnson broke off from the trio to pursue a solo career in the late '80's, Sam can be heard on many of Big Jack's recordings as well as some duo projects with Frank. Sam is also featured on three Willie Lomax albums, and recordings by Buddy Guy and several Fat Possum artists including Asie Payton. 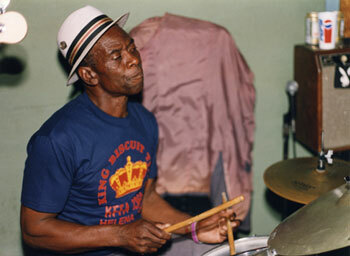 Sam Carr has won numerous Living Blues Drummer of the Year awards, and is known as the best Delta Blues drummer in the world today. Anyone who has witnessed Sam live, especially in the close quarters of the juke joints such as Eddie Mae's Cafe during King Biscuit Festival time can attest to the claim. As Living Blues senior editor Brett J. Bonner says, "Sam understands the essence of the blues. He is a minimalist. He will drop down into a groove so deep that you'll have to shake him to get out of it." A groove so deep, it shook the juke joints down.